Welcome to a new episode of Return to the 80s! This was a hard fought battle to get this posted. Del and I had recorded another episode a week before this one, and it did not come out at all. So we had to have a do-over, and Robert was able to join us this time. In case you are wondering who Del is…he’s the one giving you the Remember That Song every day. He also hosts an 80s radio show, which we discuss in this episode. Speaking of this episode, we each had gone to a concert, which we discuss in this episode. Recently (August 1) MTV celebrated its birthday. Thirty-six years ago the channel that changed pop culture and affected the way all of us listened to – and watched – music played the first notes of The Buggles Video Killed the Radio Star and followed that with Pat Benatar’s You Better Run. The rest, as they say, is history. The channel that many thought could never work definitely worked and influenced music sales for the next two decades. Not everyone liked the shows MTV would add later and not all of them were successful, but that beginning, that core of music videos, concerts, and interviews with the artists left an indelible impression on all of us who sat glued to that cable channel. Personally, I did not truly watch MTV until I moved back to the United States after living on an army base in Frankfurt, (then) West Germany for six years. Music videos did become a very precious commodity, though. In those years before MTV Europe, friends and/or acquaintances would travel back to the United States for holidays and summer vacations. Whenever anyone came back to the U.S., they always returned to Germany with a six hour VHS tape full of MTV – commercials and all. Those tapes made the rounds and were dubbed and dubbed and dubbed. We watched these videos until the tapes broke. Do not forget that these were the days before YouTube and there was really no other way to get a hold of these sacred clips. I vividly remember the all night sessions of Atari video games (that would later evolve into Commodore 64) with these VHS tapes of MTV rolling in the background. We would be mashing the buttons on the joysticks and singing at the top of our lungs. And when it was not our turn to play, we turned around and watched those videos – and sing at the top of our lungs. Like most teens in the ‘80s, MTV was a major part of my growing up and I do really miss it now. Just a month ago I was visiting my best friends in Louisville. We did not turn on MTV as that would be a futile effort today. We went to Youtube and found a playlist of ‘80s hair bands and feasted on those classics! Simply put: MTV helped form me into the adult I am today. Now as I am faced with a crossover event with our fellow ‘80s brothers and sisters, I am able to write about my favorite ‘80s video. There are so many choices, but my choice is an easy one. To me, despite all of the possibilities, my favorite ‘80s video begins and ends with a-ha’s Take On Me. The story is simple: lonely girl falls for a cute boy in a comic book; boy pulls the girl into the comic book; boy gets into trouble; boy helps girl get back to real world; girl sees boy get beat up; boy escapes the comic book and rejoins girl in real world – that old chestnut. The story is not a complex one, but I do have a preference for videos that tell a story. There is not much time to develop character or plot in three to four minutes, so the video’s creators must rely on archetypes and stock characters and situations, as this one does. It is the creative twist of enhancing a regular comic adventure and combining it with live action that makes this one stand out. The aspect that really makes this one jump out, though, is this combination of drawn scenes and live action scenes within each other – not just as clever cut away edits. The hero (Hartek), after winking at the girl, reaches out and brings her into his comic book world. In the above scene lead singer live action Morten Hartek sings the chorus to the comic book version of the girl. Now reverse the scene as the girl looks amazed at a comic book Hartek. Note that in both stills the panels of the comic book remain, giving the viewer the sense of remaining in the comic book with the characters. Here, the hero Hartek breaks out of the comic book and into the real world. Clearly, technology today is way better than it was in 1985, but the creativity used in the creation of this video is a clear hallmark of what videos could be and what they will become. I give the slight edge to a-ha’s video over Dire Straits’ Money for Nothingbecause of the lack of the burgeoning computer technology. I absolutely love both the Dire Straits video and You Might Think by the Cars and the way computer graphics are used. Both are clever and original, but both are also missing the clear story and characterization. Neither have a clear series of events that lead to a true climax. To me, Take On Mecombines the “story-ness” that I love in videos with comic book cartoonish graphics, and live action that is cleanly originally blended in to heighten the overall video experience. All of this packed into a whopping 3 minutes and 43 seconds. It will always be my favorite video of all time. Summer is almost over and I am gearing up for another school year. I have been busy all summer with school stuff – scoring AP test in Tampa, attending an AP institute in Bowling Green, and finishing my fellowship at the United States Holocaust Memorial Museum. It has been a busy summer, but a great one. As school starts I always like to reflect on the previous year. I usually do this around graduation time, but I did not do this last spring because I did not want to face it. Face what? you ask. Graduations do not bother me – well, until last year they did not bother me. Something HUGE made the class of 2017 different than others. It dropped a large boulder of a reminder right on my head. It has been thirty years since I graduated! Yes, I am a proud member of the class of 1987 and yes, that number – 30 years ago – freaks me out. So to fully confront my uncomfortable nostalgia with 1987, I have decided to take a closer look at this year that was very formative in my development: I did graduate high school and start college; I did start the path on my teaching career; I did fully fall madly in love with my girlfriend (now wife); and I did really become the person I am now. Over the next few months, I am going to take a look at some of my favorite albums of 1987 (sorry U2 fans, there will be NO Joshua Tree here). I will also take a look at the top television shows, movies, and songs of 1987. In short, instead of running away from that dreaded number 30, I am going to confront it straight on and deal with it. Welcome to the latest 80s Crossover Event! This month, The 80s League is tackling 80s Movie Villains. Look for a Return to the 80s podcast episode on this topic, coming soon. There are so many awesome villains to choose from, so I would highly recommend these other blogs and podcasts, and see who they choose. And in addition to our podcast, Robert wrote this article on his favorite ’80s movie villains. We would love to hear who yours are. Please email us at returnto80s@gmail.com, or feel free to comment below. We’d love to hear from you. Now, make like a tree and get out of here, and check out Robert’s awesome article. In my high school English classes we read a ton. In different grades, different texts are read including short stories, plays, poems, and novels. While all of these have different difficulty and interest levels, they have one important element in common: conflict. A story does not exist without conflict. Take this for instance: Two friends are sitting in the cafeteria eating lunch. Friend A has a baloney sandwich and is munching away. Friend B has a ham and cheese sandwich and is also silently munching away. No conflict, no story. Let’s try this: now Friend A, who is silently eating that baloney sandwich, looks down at that sandwich and sees way too much mustard on it. Friend A slowly peels the sandwich apart, stands, and smacks Friend B in the face with it. Now we have conflict – and a story. Clearly, conflict is a necessary element in every story and one of the simplest conflicts to manufacture is good vs. evil. So many movies from the ‘80s used this conflict to intrigue us, manipulate us, enrage us. Think back to all those “bad guys” from those classic ‘80s films. That is just what I am doing here. I have decided to present my list of most hated ‘80s villains, all terrestrial – no aliens or monsters – just humans, dastardly, ugly, conniving, horrible humans. I first saw The Karate Kid upon it’s release in 1984. The only actor I recognized was Pat Morita who played Daniel LaRusso’s karate instructor Mr. Miyagi. The protagonist, LaRusso is new to California and goes to a new high school where he knows no one. He is the natural underdog who becomes an easy target for the Cobra Kai, a local karate dojo. Two members of the Cobra Kai, instructor John Kreece and his star pupil, Johnny Lawrence, take it upon themselves to make a living hell for poor Daniel. Johnny and his boys continually jump a helpless LaRusso who receives no sympathy from dojo leader Kreece. Johnny continually beats the tar out of Daniel with the full support of Kreece who does not believe in any sort of mercy for anyone. Kreece’s ultimate nastiness shines through during the finals of the All Valley Karate Championship, LaRusso picks up an injury to his knee in the semifinals (another Cobra Kai member delivers an illegal blow, at the behest of Kreece). During the final round LaRusso is pitted against Johnny. He is clearly bothered by the knee injury and Johnny can see his weakness. After dropping a few points, LaRusso is able to claw back a bit and get a point himself. Johnny gets a bloody nose and, during the time out, talks to Kreece. It is during this talk the Kreece delivers his horrible line, “Sweep the leg. . . You have a problem with that? No mercy.” Of course, Johnny does it. Even though he knew it was wrong, he does it. Both are nasty to the core. A year later I saw Back to the Future in theaters and and other pretty nasty character reared his ugly head – Biff Tannen. Biff is a sarcastic bully who is used to getting what he wants all of the time. He picks on the hero Marty McFly, accosts Lorraine, and makes George McFly do his homework. He verbally abuses everyone around him. From calling George an “Irish bug” to labeling Marty a “butthead” (in the same scene), Biff is an insufferable jerk. Perhaps his ultimate barbarous nature comes out during the film’s climax. Biff spots Lorraine in a car by herself. Biff takes it upon himself to attack Lorraine, saying that she knows she wants it. There is not one redeeming quality of Biff in the entire film. How happy were we all when George punched his lights out? Same year (1985), different bad guy, or bad guys. In The Goonies, the evil doers were a sweet, loving family – the Fratellis. The Fratellis are a family of criminals who are hiding out in an abandoned restaurant. Unfortunately, the young, adventurous kids, looking for a way to financially save their home, encounter this nasty clan. From housing a dead guy in the freezer to threatening Chunk with putting his hand into a blender, the Fratellis know no boundaries. They let their greed get the best of them and follow the Goonies as they trace One Eyed Willy’s lost treasure. Perhaps one of the worst things this detestable family does is chain one of their very own in the basement, brother Sloth. Sloth is sweet, loving, albeit physically deformed man who is left alone in the basement, chained to his chair with a TV all that keeps him company. Thefts, murder, lies, and abject cruelty is all this family knows. Horrible. One of my good college buddies was a foreign student from Chile. He loved 1988’s release Die Hard – this is not unusual. What is strange, though, is that he loved Hans Gruber, the bad guy! Whenever he saw me, he would look at me and utter in (in a Spanish influenced German accent, “We must not alter the plan.” It always made me crack up, but I could have absolutely no sympathy for this nasty terrorist. Gruber and his minions attack and take over a high rise building in Nakotomi Plaza. While Gruber feigns the attack as a protest against the company president, Joseph Takagi, his real motivation is greed. Gruber wants to $640 million in bonds that are kept in the building’s vault. So much for ideals. Gruber does his best to, not only steal this money, but knock off a few innocent workers and make life extremely difficult for hero, John McClane. A scene that perfectly shows Gruber calm maniacal nature takes place with company president Takagi sitting right in front of him. With a gun on the table, Gruber insidiously says, “I’m going to count to three. . . One. . .Two”. . . [Takagi pleads ignorance] Three [Gruber calmly puts a bullet through Takagi’s head].” Yes, Hans Gruber is calm and always in control; he is intelligent and quick witted, as well. Unfortunately, he uses these talents in a malicious manner for self serving reasons. His self righteous confidence is nearly as bad as his villainous actions. As I ran through ‘80s movies and tried to think of all the bad guys, I thought my list was complete. Then, while I was listening to an American Top 40 countdown from 1985, Harold Faltermeyer’s “Axel F” came on. Hearing this song brought me back to the hilarious movie and it’s nasty denizen, Victor Maitland. Maitland is a high end art dealer in Beverly Hills who has had his men assassinate hero Axel Foley’s best friend Mikey Tandino. Foley wants to solve his friend’s brutal murder and traces the bonds Mikey stole to Beverly Hills and Victor Maitland. Maitland is another one of those calm villains who has his henchmen do most of his dirty work. He is sneaky and gets past most laws through bribery, threats, and outright intimidation. His calm passivity is just a mask for his true ruthless nature. He is an honest to goodness devilish character who most should not mess with. All five of these character are horrible, dirty, lowdown, despicable, diabolical, heinous (the synonyms could go on for a while) people. They have no redeeming qualities and we are all happy when they lose. Oh yes, they do lose. In true archetypal fashion, in the conflict between good and evil – good wins, always. After all of these movies we are left with true relief as Daniel LaRusso beats Johnny at his own game; as George McFly lays out Biff; as the Fratellis are outwitted by the Goonies; as John McClane watches Gruber fall from the top of Nakotomi Plaza; and as Axel Foley blows Victor Maitland away. Our heroes always defeat these villains, reassuring us that, although the world can be a harsh, chaotic place, there is room for good to prosper. I LOVE JOURNEY! ever since I bought the Escape album with my own money in 1981. I had heard their songs on the radio for years as a kid, but when I heard “Stone in Love” I knew two things: that I had to have this album and that Journey would become one of my favorite bands of all time. As it turns out, I was right. I bought everything that Journey put out after Escape, got a hold of everything before Escape, and bought all of the music the band put out as solo artists or with other musicians. I follow the band and it members on Twitter and I am eagerly anticipating seeing them perform on March 25 in Lincoln, Nebraska. Oh, wait, wait . . . that’s not Journey – Steve Perry is not with them. If you follow guitarist Neal Schon on Twitter, you will understand what I am about to say. I am appalled at how many Journey “fans” ask Neal about Steve Perry. They ask and ask and ask. Neal replies (again, again, and again) patiently that the ball is in Perry’s court. If he wants to come back to the band, he will be welcomed back with open arms (see that, two Journey songs in one sentence). As we all know, Raised on Radio would be their last release for ten years. The band fractured a bit; Steve Perry had some health issues, and . . . well, you know. Trial By Fire would be released in 1996, but it would be the band’s last album with Steve Perry on vocals. Yes, Perry has what many consider the best voice in rock. I love him and the songs he has with Journey – – but is it time we moved on. Journey is still an excellent rock band who has continued to produce fantastic albums and, more importantly, play live shows that live up to their legendary name and are packed with fans. I will not discuss the “Perry years” here; instead I will defend Journey as a band who deserves their induction into the Rock and Roll Hall of Fame and should be supported as an all time great American rock band. Let’s begin with plain old musicianship. It is impossible to define Journey as anything but a tight group of musicians who play as well as anyone out there. The present line up of Steve Smith (drums), Ross Vallory (bass), Jonathan Cain (keyboards), and Neal Schon (guitars) are just plain good. Let’s just isolate Schon. No one can deny that the riffs he plays with Journey are excellent! Need a reminder? Just pop in the song “Escape.” Need I say more? Do you still need more convincing? OK, let’s give a listen to Schon’s work outside of Journey. He has several solo albums: Late Night, Vortex, The Calling to name three (my personal favorite track is “I’ll Cover You” from the first album listed here). Schon also released two albums with keyboardist Jan Hammer, Untold Passion and Here to Stay (give “No More Lies” a listen). He was also a part of two groups: HSAS with Sammy Hagar (listen to “Missing You”) and Hardline’s first album Double Eclipse (listen to anything on this album). What all of these have in common is the presence of a virtuoso guitarist who can play any number of musical styles. 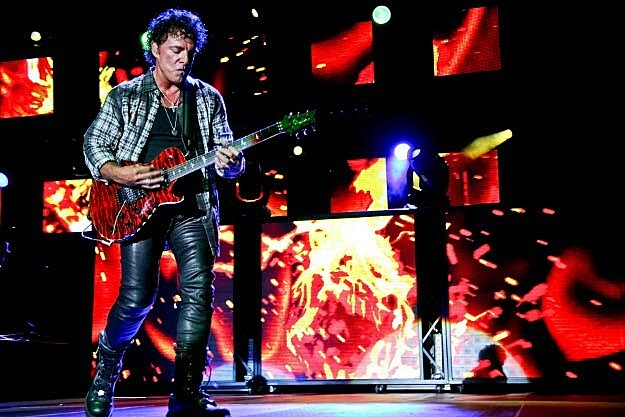 Yes, Neal Schon can rock – and he does – but he can do so much more. Watch Schon play live, no matter what the songs are, is most assuredly worth the price of admission. Great musicians keep releasing high quality albums, not matter who is singing. Since Steve Perry’s departure, Journey has released four original albums: Arrival (Steve Agueri on vocals), Generations (Steve Augeri on vocals), Revelation (Arnel Pineda on vocals), and Eclipse (Arnel Pineda on vocals). The last two of these albums with Pineda both reached the top 20 on the album charts. On these albums the band still sounds great! Solid rock music with some experimentation and some fusion of sounds. Several songs like “Never Walk Away” and “After All These Years”, and “Higher Place” are just plain ol’ classic Journey tracks. Are any of these albums Escape? No, of course not, but consider other bands and ask what their best album is. Are all of them great? Does U2 have another Joshua Tree? Does Bon Jovi have another Slippery When Wet? (OK, New Jersey is dang close). I think you get my point, Escape may be the pinnacle of Journey albums, but there is no reason to ignore what has been done since 1981. As much as I love Raised on Radio, it does not hold a candle to the brilliance of Escape. Take musicianship and post-Perry albums, now add concert receipts. Journey still sells concert tickets. Vocalist Arnel Pineda clearly sounds quite a bit like Steve Perry, and perhaps this has helped ticket sales, who knows? Pineda’s story is amazing and he is a great vocalist. I would love to have Pineda’s talents; I would be on the road right now, belting out Journey classics – “Someday, love will find you, break those chains that bind you . . .”, but I digress. Simply put, the man can sing and he deserves the respect of all Journey fans. In fact, the entire band does. I am no different than the rest of you Journey fans – I miss Steve Perry. I wish he was still with the band singing those classic tunes. I never had the chance to see Journey perform live with Perry, although I have several live cds and dvds. I know it is not the same. I would give anything to have Perry lead me (and the crowd) in the Na-Na-Na-Na-Na chorus of “Lovin’, Touchin’, Squeezin’”, but it is not going to happen. Instead of pining for this and tweeting Neal Schon endless and repetitive questions about Perry’s return, I chose to enjoy Journey for who they are, a legendary American rock band! I will continue to listen to all of the albums. I travel with my Journey Essentials collection and Time 3 and will continue to do so. I am thrilled that they finally received the Rock and Roll Hall of fame induction that they have deserved for years. I will attend the Journey concert (with Asia opening for them) in a few weeks. I will sing all of the songs with Arnel. I will bounce my head to Ross’s bass. I will pump my first with Steve’s drums. And I will air guitar with Neal until my fingers bleed. Journey is Journey – appreciate them while we still have them. Come back here in a few weeks for a review of their show. Do you agree or disagree with this? We would love to hear from you! Please email us at returnto80s@gmail.com. All of these verses are framed with an answer, no a cope out, really. Unfortunately, these situations and occurrences exist – and the answer lies in the chorus. The way many people excuse these deplorable situations is simply with the excuse, “That’s just the way it is.” As Hornsby recognizes, this is not an answer and we should not settle for such a response. Things do not have to be this way and we do not have to accept it. If we continue to accept these things because it has always been that way – if we settle for this, then nothing will even change, nothing will ever improve, we will never truly be equal. There it is, my first list in a series of list. These are my top ten favorite ‘80s songs that have a social conscience. It is a reminder that in the ‘80s, just like today, we need to slow down and look out for others in the world. Not everyone is living in a great situation and these songs remind me that I am very lucky. I grew up lucky and still lead a life that is fortunate. I play these songs for my children so they can see that not everyone is like them or as fortunate as they are. And puttin ’em in a pen . . .
Crazy people walkin’ round with blood in their eyes . . .
Wild-eyed pistols wavers who ain’t afraid to die . . . Simple, yet effective. This type of in your face protest song bothers some people. While I understand why this is, I like to think that we need these type of songs to get us to reexamine our beliefs and policies. Things might not change, but they might if change is needed. No, this is not great, earth shattering writing, but it did help raise awareness in Americans who did not know much of what was happening in South Africa. Side note: if you have any interest in Apartheid in South Africa I recommend two books – Kaffir Boy by Mark Mathabane (non fiction) and The Power of One by Bryce Courtenay (fiction).